Which models are in demand? 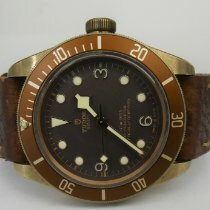 What should I pay attention to when buying a bronze watch? How much do bronze watches cost? Many bronze watches are popular amongst collectors. Due to the patina that develops on these timepieces, each one is unique. 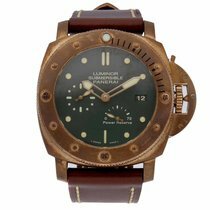 Limited special edition models such as the Panerai Luminor Submersible 1950 Bronzo have significantly increased in value. Bronze watches from Swiss luxury manufacturers have been hugely popular in the past few years. The trendy timepieces have a retro charm. The first bronze watches were introduced towards the end of the 1980s. Amongst these early models were the manual Regulateur from the Swiss manufacturer Chronoswiss and the Gefica chronograph from Gérald Genta. Genta is one of the most famous watch designers in Switzerland, responsible for designing iconic watches such as the Audemars Piguet Royal Oak and the Patek Philippe Nautilus. In 2011, the Italian watch manufacturer Panerai launched a new watch, the Luminor Submersible 1950 Bronzo with reference number PAM00382. The diving watch was limited to 1,000 pieces and its price has since increased significantly. When first released, the timepiece cost 7,600 euros. Today, you need to set aside at least 27,000 euros for a pre-owned model. New, this bronze watch costs more than 40,000 euros. Its successor with reference number PAM00507 also experienced a similar price increase. After the bronze Panerai watches were such a success, many other manufacturers began using the material in their own watches. Above all, diving and pilot's watches were produced in bronze. The most famous models are the Tudor Heritage Black Bay Bronze, the Oris Carl Brashear Limited Edition, the Zenith Pilot Type 20 Extra Special, and the IWC Aquatimer Chronograph Edition "Expedition Charles Darwin." The cases of these timepieces are made of a predominantly copper alloy which also contains zinc, aluminum, or iron. Oxidation, the chemical reaction with oxygen, causes a patina to form on the alloy over the years. This process transforms each bronze timepiece into a one of a kind piece. However, you can also easily clean your bronze watch with common household cleaning products and remove the patina. Due to the high copper percentage, the substance can leave traces of green on your wrist if the case comes into direct contact with your skin. Therefore, most manufacturers pair a bronze case with a stainless steel or titanium case back. There are bronze watches available at almost every price level. The German manufacturer Steinhart offers many affordable bronze watches for less than 1,000 euros. Watches from Oris and Tudor have mid-range prices. The Luminor from Panerai is in the upper price range. The Swiss manufacturer Tudor introduced the Heritage Black Bay Bronze in 2016. The diving watch's satinized 43-mm case is made of aluminum bronze and is waterproof to 200 m (20 bar). Tudor used coated stainless steel for the case back and the dial and bezel are brown. The bronze Heritage Black Bay is paired with an aged leather strap and comes with an additional fabric strap. This bronze watch's design is modeled after historic Tudor timepieces. It has eye-catching features such as a large crown without a crown guard, domed glass on the front side, and a dial with Arabic numerals at three, six, and nine. It also has distinctive "snowflake" hands, which were first used in the 1970s on military watches Tudor delivered to the French marines. Both hands and hour markers are luminous and therefore also easy to read in the dark. One highlight of the Heritage Black Bay Bronze is its in-house caliber MT5601. Tudor developed this caliber especially for this timepiece. The MT stands for "Manufacture Tudor." The automatic movement has a 70-hour power reserve and is chronometer certified by the Official Swiss Chronometer Testing Institute (COSC). A chronometer is an especially accurate watch that only deviates from the reference time by a few seconds each day. Since this bronze Tudor watch has only been available on the market since 2016, there are few pre-owned models currently available. New, the price for this timepiece starts around 3,300 euros. There are only 2,000 Oris Carl Brashear Limited Edition watches worldwide. The independent Swiss company dedicated the bronze diving watch to the marine diver Carl Brashear, the first African-American US Navy Master Diver. The 2000 film Men of Honor focused on the challenges that Brashear faced throughout his career. He was portrayed by Cuba Gooding, Jr. This Oris watch's bronze case has a stainless steel case back engraved with a professional diving helmet. The wristwatch's design is inspired by such a helmet. The 42-mm watch is waterproof to 100 m (10 bar) and features a rotatable bronze bezel with a minute scale. Domed sapphire glass emphasizes this watch's retro look and is also very scratch resistant. Oris decided against adding crown protection. The blue dial creates a striking contrast to the bronze bezel and case. A dark brown leather strap keeps the watch securely on your wrist. The caliber Oris 733, based on the Sellita SW 200-1, powers this bronze Oris watch. The automatic caliber displays the date at six o'clock, and a stop-seconds mechanism allows you to set the watch to the exact second. The movement has a 38-hour power reserve. You can purchase a pre-owned Oris Carl Brashear in very good condition for around 2,400 euros. New models are available starting at 2,800 euros. When it was first released, the watch only cost 2,600 euros. Thus, its price has risen after only a short time, and it's quite possible that it will continue to increase in value. The Zenith Pilot Type 20 Extra Special pays homage to historical pilot's watches. It has an oversized crown and a 45-mm case. Its size makes it easier to read while flying, and a large crown makes it easier to wind and set the watch with thick gloves on. The titanium case back is engraved with a historical plane as well as the brand's logo. The timepiece is waterproof to 100 m (10 bar). The black dial features luminous Arabic numeral hour markers. The hands are also luminous, allowing you to easily read the watch in the dark. The in-house caliber Elite 679 powers this timepiece. The automatic movement's winding rotor is decorated with Geneva stripes. This Zenith movement has a 50-hour power reserve. You can buy a new bronze Zenith Pilot Type 20 Extra Special for around 4,500 euros. The special edition IWC Aquatimer Chronograph Edition "Expedition Charles Darwin" honors Charles Darwin's scientific accomplishments. The bronze case is reminiscent of the HMS Beagle, the ship that brought the scientist to the Galapagos Islands in 1835. At that time, many parts of ships, such as the portholes, were made of corrosion-resistant bronze. In line with the bronze case, the luminous hands and indices also glow a bronze color. The Aquatimer collection features a unique internal/external bezel to keep track of your dive time. Normally, diving watches have a unidirectional rotatable bezel with a scale to track your dive time. However, on the IWC watch, this scale is on the internal bezel. You turn the internal bezel by rotating the outer bezel counterclockwise. The case back features a portrait of Darwin. The chronograph is waterproof to 300 m (30 bar) and comes paired with a rubber strap with their patented quick-change system. The in-house caliber 89365 powers the IWC Aquatimer Chronograph Edition "Expedition Charles Darwin." This automatic movement features a chronograph function, date display, and 68-hour power reserve. You can buy a pre-owned diving chronograph from IWC starting at around 7,000 euros. These models are in very good condition. New watches cost around 7,300 euros.